The stylus has returned in a big way at this year’s Mobile World Congress with the Samsung Galaxy Note 10.1 and the LG Optimus Vu. Styluses seem to be back in fashion this year with the launch of the Samsung Galaxy Note 10.1 tablet and the LG Optimus Vu smartphone at this year’s Mobile World Congress in Barcelona. 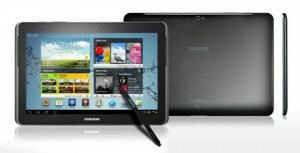 Samsung’s Galaxy Note 10.1 is the follow-up to last year’s Galaxy Tab 10.1. By adding S-Pen stylus support (as previously seen on the 5.3-inch Galaxy Note), Samsung are hoping that the combination of large tablet screen size with pen technology will free people up to create digital content in new and innovative ways. Meanwhile, LG’s Optimus Vu is a 5-inch smartphone. Sitting somewhere in size between a typical smartphone and a typical tablet in terms of size, the Optimus Vu features a 5-inch display in a 4:3 aspect ratio which is optimised for reading books and print material. In this article, we look at the history of the mobile phone stylus. We’ll look at how the stylus was borne out of necessity on early touchscreen mobile phones and how the launch of the iPhone and the use of capacitive touchscreen technology led to the death of the stylus. We’ll then go on to look at newer stylus technologies employed by devices such as the Samsung Galaxy Note, the LG Optimus Vu and the HTC Flyer and how they differ from older stylus technologies. Ken’s Tech Tips should thank the hospitality of Samsung Electronics at Mobile World Congress: please see the full disclosure notice. 4 How much difference does a pen make to the precision that can be achieved? 5 What are the benefits of pen input? 6 Are we likely to see more mobile devices with pen input in the future? Steve Jobs once said of smartphones, “If you see a stylus, they blew it”. He was referring to the styluses which were commonly used with resistive touchscreen technology – the type of touchscreen that was seen in phones prior to the launch of the original iPhone in 2007. Resistive touchscreens consist of two flexible plastic sheets. The uppermost sheet is made from a flexible material so that it bends under pressure. When the two sheets in the touchscreen are pressed together, a voltage is registered at that point which allows the phone to determine which region of the touchscreen has been pressed. As a reasonable amount of force needs to be applied to in a small region in order for a touch to be registered, many of the resistive touchscreen mobile devices of the time were bundled with resistive styluses. These were essentially small pieces of plastic which would concentrate the force applied by your arm into a smaller region. This increases the pressure (force divided by area) which is applied to the screen hence increasing the compression of the plastic sheets together so that a touch is registered. The release of the iPhone in mid-2007 changed the game by introducing a new touchscreen technology: the capacitive touchscreen. Rather than requiring physical pressure to be exerted on the screen, capacitive touchscreens work by sensing the presence of your finger as it sits on the screen. This is possible as your finger produces a small electric field. Because it is the presence of your finger that is being detected in a capacitive touchscreen rather than pressure as in a resistive touchscreen, touchscreen operation is much smoother and more rapid. The touchscreen gestures that we’ve all become accustomed to (e.g. swiping side-by-side between screens and scrolling through menus) has become possible due to capacitive touchscreen technology. Multi-touch gestures such as pinch-to-zoom have also been made possible with finger-friendly capacitive touchscreen technology. Because capacitive touchscreens are designed to be finger-friendly, there is no need to use a stylus on a capacitive touchscreen. With the birth of the iPhone and the adoption of the capacitive touchscreen, we said goodbye to the mobile phone stylus. The new Galaxy Note 10.1 features S-Pen technology. It’s been 4 years and 2 months since the launch of the iPhone. We were sitting at a press conference on a cool and cloudy day in Berlin. At the Samsung Unpacked event on September 1st 2011, Samsung introduced the Galaxy Note: a 5.3-inch smartphone/tablet hybrid which is equipped with the ‘S-Pen’ stylus. For us, this event marks the rebirth of the stylus – the announcement of the Galaxy Note was the first time in over 4 years that a mobile phone manufacturer has included a stylus with their flagship mobile product. Unlike first generation resistive styluses which were borne out of necessity, second-generation stylus products such as the S-Pen are borne out of our desire to interact with our mobile devices in more personal and more creative ways. Both the Samsung Galaxy Note and the LG Optimus Vu still feature the finger-friendly capacitive touchscreens that we have grown to know and love – their capacitive touchscreens allow us to swipe, scroll and scale with great speed and precision. Their styluses only come into play by augmenting this touch functionality. The stylus input of the Galaxy Note and Optimus Vu is designed to be used for note taking, document annotation and the sketching of ideas and concepts in a graphical manner. The Galaxy Note’s S-Pen uses Wacom’s Electro-Magnetic Resonance (EMR) technology, whilst LG’s Optimus Vu use ‘Rubberdium technology’. HTC’s Flyer uses n-trig technology. Like how capacitive touchscreens can “sense” the presence of your finger, the pen-enabled displays of the Galaxy Note and Optimus Vu can sense the presence of the pen sliding over the display. The most advanced pen, Samsung’s S-Pen is powered through electromagnetic induction and provides 128 levels of pressure sensitivity. 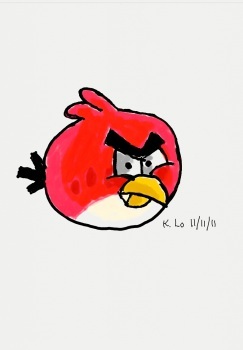 It also provides greater precision than trying to draw directly using a finger. How much difference does a pen make to the precision that can be achieved? For handwritten notes and free-form sketches, a pen makes a great deal of difference in the precision which is possible. 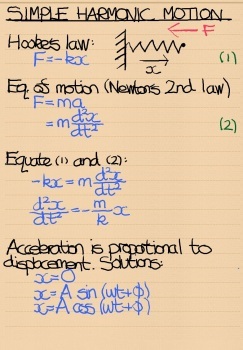 The following image shows our attempt at handwriting on the screen of the Galaxy Note. The first attempt used a finger input (touch) whereas the second attempt uses pen input. As we can see fairly clearly, much greater precision is offered by the pen input. The result is a much more legible, natural and aesthetically pleasing piece of handwriting. Handwriting is much easier using a pen than a finger. 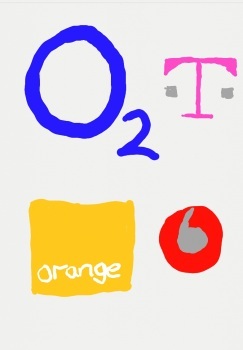 See our demo video of handwriting on the Galaxy Note. What are the benefits of pen input? The benefits of pen input are most obvious when creating and annotating content. In general, smartphones are incredibly good at allowing us to consume content: many of them feature lightning-quick processors, beautifully vibrant organic LED displays and high-speed connectivity options. 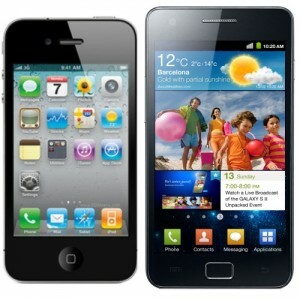 Whether we want to read e-mails, browse the web or watch videos, smartphones generally offer a very good experience. The area that they falter in is in creating content: novelists still write with ink, artists still sketch on paper and mathematicians still write equations by hand. Pen input can provide a quick and a natural way to get these ideas down onto paper. Pen input is useful for sketching, making notes and creating content. Are we likely to see more mobile devices with pen input in the future? With Samsung and LG having both jumped onto pen input bandwagon, we believe it is likely that mobile manufacturers will continue to release pen-enabled smartphones and tablets in the coming future. For the time being, pen input is likely to be restricted to larger, more high-end devices. For the full potential of pen technology to be realised, software support still needs to be improved. We’d love to be able to do things such as annotating straight on top of a book in an e-book application, but the software support is still lacking a little and the technology needs to become mainstream. Disclosure Notice: I am currently being hosted in Barcelona by Samsung Electronics, the manufacturer of the Samsung Galaxy Note. The views expressed in this article are totally my own and reflect solely my own views and experiences of using the device. Thanks Ken. I will keep looking for software. I totally agree with your comments about a stylus. I love the handwriting input. I would prefer a smaller unit than the note, but am happy to live with the size to use a stylus. I’ve used stylus’s since the early palm handhelds. It would be great if the stylus came back for all sizes. Hi ken. I saw your youtube video of handwriting recognition on the Galaxy note. I have a Galaxy note 3 and I’m trying to get software that will enable me to write on the whole white screen, instead of into a “letterbox”at the bottom of the screen. I used calligrapher on windows mobile and you just kept inputting Words which were translated in sequence. You seem to be doing all of This in your video. What Software did you use? Many Thanks. Thanks for your comment! For the video, I used the S Note application on the original Galaxy Note. Unfortunately, however, the feature seems to have been removed on the newer versions of S Note. My Galaxy Note 2 also lacks this option – you only get handwriting recognition in a small “letterbox” at the bottom of the screen (similar to your Galaxy Note 3). There might be a third-party application or the feature may have moved elsewhere (I’m afraid I don’t know the answer to this question – sorry!). It was ridiculous getting rid of the stylus. The Pocket pc had soooo many more functions on a screen. Trying to highlight a document, use any app with ANYONE's fat fingers on a little screen is madness. Even on a little bigger screen it's madness. Have you tried to use a word processor or excel spreadsheet without a stylus? The number of functions is NOTHING compared to the stylus days… Steve Jobs was so "hip," people fell into it. Bring the stylus back on ALL smartphones and tablets!